﻿ グローバルコムデータベースサービス(年間購読) / TeleGeography - PriMetrica, Inc.
"I spend a lot of my time talking to our GlobalComms users. I’m frequently asked how we cultivate such a robust resource. Truly, it’s our experts. Their years of experience make products like GlobalComms invaluable." Staying on top of changes in the telecoms market is a lot of work. Let our experts do the heavy lifting. Say hello to the largest online database of wireline, wireless, and broadband competition. Our experts' hard work shows. Each day, our analysts scour press releases and company websites to stay on top of recent developments. We compile new telecom metrics where available and integrate it with our data timeseries that go back 15 years. 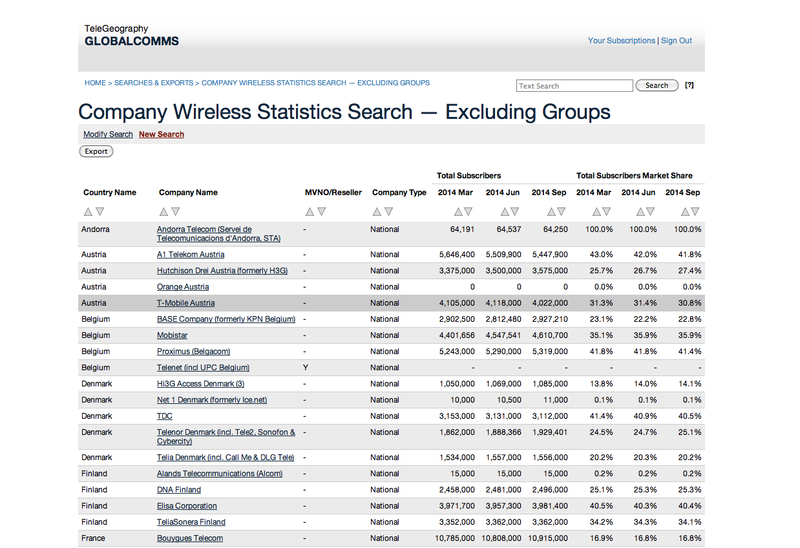 With a continuous update cycle, the GlobalComms Database is your go to for the state of the telecommunications market. Wireless, broadband, and fixed line market data for over 220 countries. Metrics for more than 950 mobile service providers, over 570 broadband ISPs, and upwards of 475 fixed-line operators. Country and company profiles detailing telecom markets in over 215 countries. GlobalComms provides information and statistics about over 1,800 telecom companies and markets in over 220 countries. 3G and 4G licenses, including fees, license duration, frequencies allocated, etc. Explore fixed-line voice subscribers updated annually from 1999 to present. Search country service revenues and ARPU data for more than 70 countries. Data for more than 950 service providers from 2003-present, updated quarterly. Data for 475 fixed-line voice operators, updated annually from 2003 to present. Search 1G-5G wireless networks, by country, operator, deployment date, operational status, platform, evolution, frequency, and launch date. Explore broadband networks by country, operator, deployment date, technology, frequency, launch date, and operational status. Query fixed network data by technology, country, and operator. Country and company profiles provide detailed background on the telecom markets in over 215 countries. Profiles include an overview of more than 1,800 national telecom operators and 40 multi-national operator groups. Wireless, broadband, and fixedline market data for over 220 countries at your fingertips. Plus, metrics for more than 950 mobile service providers, over 570 broadband ISPs, and upwards of 475 fixed-line operators. This is the GlobalComms Database. While there is a common perception that global fixed line subscribership is in free fall, and that consumers are abandoning fixed lines en masse in place of mobiles, the reality is not so clear-cut. New data from TeleGeography’s GlobalComms Database reveal that, while traditional circuit-switched (PSTN) telephone lines are declining steadily, much of the decline in switched subscribers can be attributed to the growth of fixed voice-over-IP (VoIP) services. Total (PSTN and VoIP) global fixed line voice subscribers peaked at 1.29 billion in 2008, and have declined at a compounded annual rate of 1.3% since. The fixed voice market is in a period of gradual long-term decline, but the aggregate numbers mask a large shift in market composition. While switched telephone lines have declined at a compounded rate of 4% per year, VoIP subscribers have grown 18% annually, helping to offset much of the decline in switched phone lines. VoIP connections now account for 20% of fixed lines worldwide, up from just 8% in 2008. This uptake is largely attributable to the rapid adoption of multi-play plans, where fixed voice service is bundled with broadband Internet, TV, and sometimes mobile telephony services. For example, in June 2014 US telco AT&T reported that 97% of its TV customers subscribed to at least one other service, while two-thirds of these users subscribed to three or four. It will be decades before the PSTN disappears from all corners of the world, but the trend towards VoIP is inexorable. In 2013, 25% of fixed lines in eastern Europe were IP-based, while 35% of fixed voice lines in western Europe and 33% in North America were IP. Some national incumbent providers are now transitioning to all-IP networks. Earlier this year, Deutsche Telekom enabled Macedonia to become the first country to switch fully from the PSTN to an all-IP network, and the company aims to turn off its legacy TDM switches and completely convert its network in Slovakia to IP by the end of 2014. GlobalComms is TeleGeography’s constantly updated online database of wireline, wireless and broadband competition. No other telecommunications market research service rivals its geographic scope and depth of coverage.